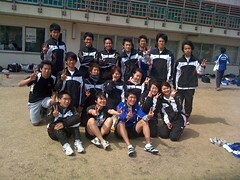 From the recent 合宿 (training camp). Why am I not in the picture? Well... It's complicated. I'm sort of first-year, but I'm also not -- I don't really fit into any good category on the team. When I absolutely have to be put into an official category (say, when I have to figure out where to sit and team banquets), I get grouped with the first-years... But out of the entire team, they're the group I interact least with (socially, etc.) Even at the training camp hotel (ryokan? It had an onsen and tatami rooms and all), I roomed with 二年生 (second-year/sophomore -- specifically, my block captain and another second-year). My status has always been strange, and occasionally awkward -- a lot of people didn't know how to relate to me, the other first-years most of all; not-exactly-first-year (not even a degree student), not-Japanese (and not really able to communicate with most of the team until lately, and still not very well), twice as old as my "seniors"... And a lousy, really slow runner. Even my jacket is unique -- I have the same pattern as the first-years, but in different colors (the same colors as the second and third-years, actually). Although that's probably as much due to me ordering it late and not specifying (or knowing that I had to) that I wanted the same colors. I guess it's appropriate, though, considering. Well I bet saying you're the mascot would be the best status description. If I'd be there we could be the awesome and the ultra awesome slow runners team :P (me beeing the latter :p).